The Ace of Pentacles Minor Arcana Tarot Card is always a hopeful sign that a fullness of life and more of it is about to begin. Depending on the reading spread, it can mean new financial prosperity or an abundance of love, hopes and dreams beginning to arrive. Since at least half of the readings any psychic does for someone will eventually lead around to finances, career success and prosperity, this is always a good card to see come up. The Ace of Pentacles, like the Aces of all the other suits, is representative of new beginnings, fresh approach, bigger energy and inspiration. Pentacles usually represent money and the financial concerns, indicating the beginning of new prosperity opportunities getting ready to be presented to you. There is also the possibility of an un unexpected windfall from an unknown source. The Ace of Pentacles announces the coming of more prosperity and abundance in your life. When you see this card come up in your reading, it is a message to send out positive energy into the Universe so that you may receive the new-found abundance in return. The Ace Of Pentacles pulled inverted, may hint that a hoped for financial opportunity might not possibly materialize as you expected or delays in goals you are trying to manifest if your initial plans are not re-evaluated and modified. It can also mean to be more watchful of your finances and to not live beyond your means. Considering getting a tarot card reading? We have carefully screened and selected a range of gifted, compassionate tarot card readers to provide clarity and new insights into your life. Online readers available 24/7. In General, this is always a very positive card in regards to more prosperity and abundance coming into your life. You are likely to be in an optimistic and hopeful perspective about your future. Basically, the Universe letting you know that things are getting ready to be better and start going well. 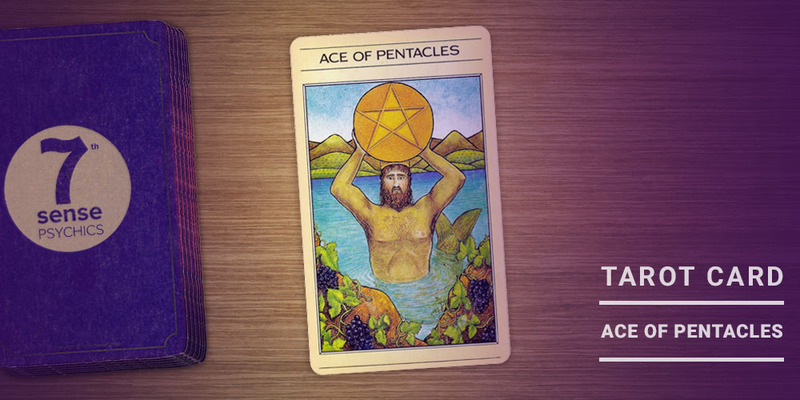 In the Career arena, if you have been considering changing departments, your place of employment or a career change altogether, the Ace of Pentacles is a green light to go for it. It can also indicate that a new career opportunity is coming your way and it is a good idea to follow through with it. When Love and the Ace of Pentacles come together, it is usually all about the possibility of the excitement over a new relationship coming into play. If you’re already committed, it may show that your relationship will be changing in ways that will make it better. Possibly showing you will begin to feel more romantic towards your partner than you have been or that a relationship you are in is getting ready to get more serious. Money aligned with The Ace of Pentacles is a fantastic card to appear in regards to your financial forecast. It is telling you that you can expect more prosperity such as a raise or unexpected windfall. Money will be much more available for you from many different sources. It is also a reminder to keep yourself in a prosperity minded path and it is not time for frivolous spending but to handle your windfall with a realistic approach. Take care of the things in your life that you may have fallen behind on and stash the rest away for a rainy day. When Health is focused on and the The Ace of Pentacles shows up in the card spread, it is a good projection of your health turning around for the better if you have been dealing with an illness. If in relatively good health, then it will suggest you will be looking to up your game in taking care of your body with more exercise and better eating habits. Spirituality and The Ace of Pentacles go hand and hand with raising the bar in your search for spiritual expansion and awareness. You may look to go to a different place of worship, try different philosophies that you have been interested in before or feel the need to reach out to others who may think as you do or become interested in another approach to spirituality. Regardless of what area of your life The Ace of Pentacles is attached to, it is usually a sign of things getting better. Almost always, the card will be associated with money and finances but wealth and abundance come in many forms. Either way, it is a great card to see in a reading, predicting that the less than enough energy you may have been dealing with is about to come to an end, bringing more of whatever is important to you at the moment. Please Universe bless me with what I need to live a better life… I thank you in advance!